It is a great delusion to think that the times of prayer ought to differ from other times. We are as strictly obliged to adhere to God by action in the time of action, as by prayer in its season. You need not cry very loud; he is nearer to us than we are aware of. We ought to act with God in the greatest simplicity, speak to Him frankly and plainly, and implore His assistance in our affairs. God regards not the greatness of the work but the love with which it is performed. Our biggest mistake is to think that a time of prayer is different from any other time. It is all one. Prayer is nothing else than a sense of God’s presence. Our only business is to love and delight ourselves in God. God does not ask much of you : a little remembrance from time to time, a little adoration. We need only to realize that God is close to us and to turn to Him at every moment. We ought to act very simply towards God, speaking frankly to Him, and asking His help in things as they occur. A little lifting of the heart suffices; a little remembrance of God, one act of inward worship are prayers which, however short, are nevertheless acceptable to God. We are made for God alone, who can only be pleased when we turn away from ourselves to devote ourselves to Him. In continuing the practice of conversing with God throughout each day, and quickly seeking His forgiveness when I fell or strayed, His presence has become as easy and natural to me now as it once was difficult to attain. God alone is capable of making Himself known as He really is. People seek methods of learning to know God. Is it not much shorter and more direct to simply do everything for the love of Him? There is no finesse about it. One only has to do it generously and simply. Let us think often that our only business in this life is to please God. The most excellent method of going to God is that of doing our common business without any view of pleasing people but purely for the love of God. We ought not to grow tired of doing little things for the love of God, who regards not the greatness of the work, but the love with which it is performed. How can we pray to Him without being with Him? How can we be with Him without thinking of Him often? How can we think of Him but by a holy habit we should form of it? The more one knows God, the greater one desires to know Him. We should establish ourselves in a sense of God’s presence by continually conversing with Him. It is a shameful thing to quit His conversation to think of trifles and fooleries. One way to re-collect the mind easily in the time of prayer and preserve it more in tranquility, is not to let it wander too far at other times. In order to know God, we must often think of Him; and when we come to love Him, we shall then also think of Him often, for our heart will be with our treasure. To worship God in truth is to recognize Him for being who He is, and to recognize ourselves for what we are. Do not always scrupulously confine yourself to certain rules, or particular forms of devotion, but act with a general confidence in GOD, with love and humility. There is not in the world a kind of life more sweet and delightful than that of a continual conversation with God. We should dedicate ourselves to becoming in this life the most perfect worshipers of God we can possibly be, as we hope to be through all eternity. 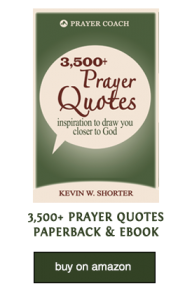 If you have enjoyed these quotes, go get over 3,500 prayer quotes on Amazon. They are all categorized by topic for ease of study and inspiration. ← How Come I Feel Alone When We Are Together?